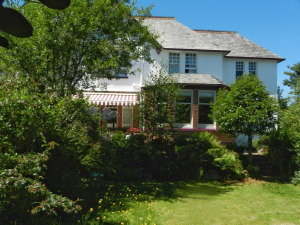 Overcombe House Guest Accommodation'Overcombe Hotel' is an 8 bedroomed, licensed, non-smoking guest accommodation located within Dartmoor National Park offering quality facilities and a personal service in a relaxed homely atmosphere. All guests can be assured of receiving a warm, clean and comfortable accommodation, and a substantial breakfast using local produce when available. There are two ground floor bedrooms; one has been specially adapted for the less mobile visitor. There is a lockable store for cycles, motorcycles or golfing equipment. The property enjoys wonderful views overlooking the village and the Walkham Valley and on towards some of Dartmoor’s Tors. All bedrooms have comfortable new beds and en suite facilities, along with colour television with 2 channel radio, tea and coffee making facilities, alarm clock, hair dryer, razor point and central heating. Some bedrooms enjoy the beautiful views. The dining room has a small bar, and a comfortable sitting area in which to relax, chat or watch television. The ancient stannary town of Tavistock is only 4 miles away and Plymouth with its range of facilities and attractions only 11 miles away. Overcombe is ideally situated for exploring both Devon and Cornwall along with their various attractions. World famous for its stunning scenery, Dartmoor National Park is best known for its rocky outcrops, woodlands and wild open stretches of moorland, with over 200 granite tors to visit you are spoilt for choice. Especially popular is Hound Tor at Grimspound – the setting for Arthur Conan Doyle’s ‘Hound of the Baskervilles’. Overcombe House sometimes limits bookings to 2 or more days. Small Double sometimes limits bookings to 2 or more days. Follow A386 signs towards Tavistock. On reaching the Horrabridge sign, slow down and take the next left turn. Continue on this road for a short distance and we are located on the right hand side. You will see our illuminated sign. Take bus no. 83 or 86 and alight at Manor Grange, Horrabridge. Service 86 goes via Plymouth railway station. After alighting, walk back towards Yelverton and Old Station Road is the first turning on the right. both David and John made us feel very welcome, the care and service was exelent, we especially liked how they looked after the wild life,after all they live there and everyone else just visits. I have adopted some of the things I learnt from them and using it in my own garden. The room was of an adequate size bed very comfortable, breakfast as much as one could eat.